Well, what a weekend it's been from top to bottom in the Premiership. Remind yourself how special that final game was by reading Gary Smee's report. Good news is it all resumes in just five days time. See you from 19:30 GMT on Friday for Harlequins v Leicester. We'll be back for more live Premiership action next week, starting on Friday night at The Stoop. Here's a run-down of what to expect. "It's hard to know what to say. "The important thing is what happens next rather than looking back on the performance. "Wasps were phenomenal today, absolutely brilliant." Confirmation of Wasps' dramatic climb up the table to fourth. "Everything that we talked about in the week came off. It doesn't happen many times. "We've got to pinch ourselves because there wasn't much we could pick fault in that. "Everything went our way today, it doesn't happen often, but it's just one of those games." "We did make a statement tonight. We thought there was an opportunity to play against these guys and play well. "The way the boys attended to their work in their preparation for this match was great, so congratulate all the players, they played extremely well. "Throughout the year we've played well in the first 20 minutes. Those three tries were fantastic, but it's what you do after those three tries and we continued to put pressure on their team." Stay tuned. We'll have some reaction to come from that tremendous victory for Wasps at Allianz Park. George Smith is the man of the match in that pulsating contest. His Wasps side are up to fourth. Saracens have missed the chance to extend their lead at the top. Quote Message: Wasps were very good in both defence and attack. They thoroughly deserve the victory. Wasps were very good in both defence and attack. They thoroughly deserve the victory. Ten tries in that one. Don't we just spoil you? Yep, no typo on that scoreline. It's time up at the end of a quite remarkable 80 minutes of rugby. It's another huge long-range effort from Wasps. Elliot Daly clearly thinks this one's too close for him so he passes it over to Alex Lozowski to notch it over from 45 metres. Elliot Daly hardly looks like he's broken sweat there and he has put it between the posts and over the bar from around 58 metres back. That is the cherry well and truly on top for Wasps. 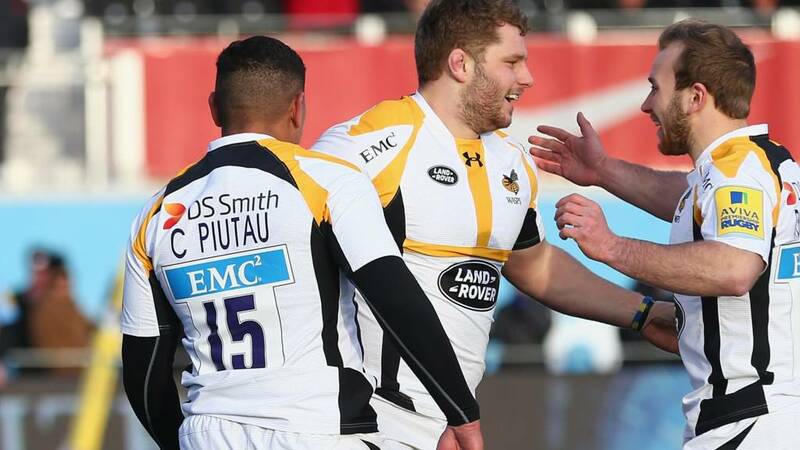 Saracens give away a penalty on Wasps' 10-metre line for not releasing. Rob Miller and Christain Wade not quite on the same wavelength as Miller's pass goes flying out of touch out wide. First real error from the visitors with the ball in their hands. Try not given to Saracens as replacement fly-half Nils Mordt is adjudged to have neck-rolled in the tackle on Alex Rieder at the clear out of the earlier ruck. I honestly didn't think the second half would match the first for entertainment and points. Absolutely fantastic rugby from Wasps. It's Dan Robson with their EIGHTH try of the game! Error at the line-out by Saracens as it's thrown too long, Nathan Hughes picks it up and runs to within 25 metres of the line. Robson is there in support and he has his second try of the afternoon in the simplest fashion. Conversion kicked by Jimmy Gopperth.